If you are looking for any kind of home decor, we have a large variety for you to choose from. 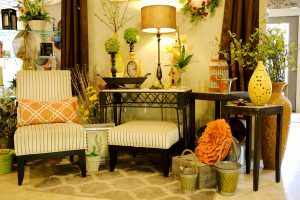 Lamps, chairs, flowers, vases, pillows, clocks, you name it we have it or are able to get it! If there is anything specific you are looking for, we would love to help you and guide you in the right direction. Feel free to look at some of the decor that we have to offer. Monday- 8:30 A.M.- 5:00 P.M.
Tuesday- 8:30 A.M.- 5:00 P.M.
Wednesday- 8:30 A.M.- 5:00 P.M.
Thursday- 8:30 A.M.- 5:00 P.M.
Friday- 8:30 A.M.- 5:00 P.M.
Saturday- 9:30 A.M.- 1:00 P.M.